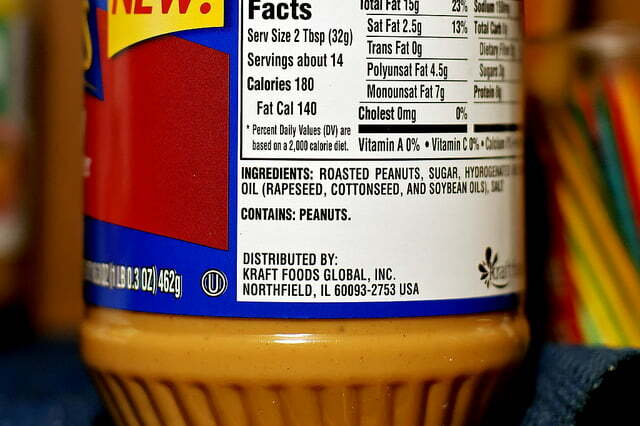 Did you know that most peanut butter is toxic? First, did you know that peanut butter is toxic because of the aflatoxin content – a naturally occurring deadly mold in the peanuts themselves? I didn't know this either! Nuts on their own are a great snack, but because they are high in phytic acid, which binds with minerals and keeps our body from utilizing them, I've been in the simple habit for years of soaking our nuts, which breaks down at least some of the phytic acid. If I can find raw nuts and then use my dehydrator to dry them, this also preserves their enzyme content to make them more digestible. Yes, you can do this to make your own nut butters by soaking, drying and then grinding, but I haven't had good luck with this, to say the least. I wasted a lot of money and time once on organic peanuts. I got them soaked, dehydrated, and ground, and there was a terrible OFF taste to them. Maybe it was the aflatoxins? So I'd rather pay more for the nut butter already made for me, than for the raw nuts that I have to mess with. As much as my kids eat nut butters, this is one of those things that are worth it to me. You can find the best, safest, soaked nut butters here – the nuts are organic and soaked to reduce phytic acid content (read more on this kind further below), but unfortunately I haven't gotten our kids to go for it yet, due to the texture – it's creamy enough for me (and tasty! ), but not for them. Plus it is expensive. Update: Here are more good-for-you nut butters I found recently, I haven't tried them yet, but plan to! This is the kind we tried and they loved it! It's affordable and creamy! As I said above, I wish I could say that I have my kids totally switched over onto the soaked and best-for-you nut butters, but they're still getting used to the different consistency than they're used to with the organic peanut butter we bought for years. I'm usually a freak about consistency, too, but with this kind, I don't even mind that it has a slight texture to it and that it's not perfectly smooth, because the flavor is so delicious. Not to mention the peace of mind in knowing how much safer and more nutritious it is. 1. Is it only peanuts that have the aflatoxin risk? Is that why you use all different nuts in your nut butters, but no peanuts? No, all nut and many other foods can contain aflatoxins. They are produced by some molds (Aspergillus flavus and Aspergillus parasiticus). Molds basically require moisture and oxygen to be able to thrive and prefer it to be cool and dark. They can grow at refrigerator temperatures though cooler temperatures do slow down their growth. Heat does not destroy aflatoxins either. These are some of the reasons that aflatoxins are a problem. A nut, seed or food that has aflatoxin on it will not look any different than a nut or seed that does not, so it's hard to know what to do. In my opinion, the best way to deal with aflatoxins is to not let the nut or seed be contaminated in the first place and proper drying at the time of harvest is essential. The tree nuts we have are all grown on small family farms, they are all certified organic and they all have really high quality product. We are very picky about where we buy the nuts and then when they come in they are kept in sealed bags under refrigeration until soaked and dehydrated. Once that process happens they are dried down to about 1.5% moisture. Considering they come in at 5-8% moisture from the grower who has already dried them, this drop is significant. Very low moisture levels like this make it almost impossible for molds or bacteria to grow and the low moisture content also greatly increases the shelf life of the nuts, nut butters. Low moisture also lowers the rate of oxidation of the oils. However, even though we know this, we still keep the nut butters and the nuts under refrigeration so that we can offer the highest quality product to our customers. We honestly do not do peanut butter because you need to roast peanuts before you can grind them when making them into a butter. We tried various ways of grinding the raw peanuts without roasting, by adding different types of oils, but were never happy with the end product. I honestly hate to roast any nut, whether it is a peanut or a tree nut. All nuts contain poly-unsaturated oils and these oxidize when heated. So I don’t roast nuts or toast nuts and that is the real reason we do not do a peanut butter. 2. In your nut butter video (scroll down to the end of this post to watch it), I notice you soak in water instead of salt water like the Nourishing Traditions recipe, or maybe that part just wasn't covered in the video? Yes we use just purified water. We tried the salted water and just plain water and then we sampled them to lots of people. The consensus was that the plain water with no salt was better. Interestingly, many people feel like we get too much salt and this is true if you are eating fermented foods that are prepared with salt such as sauerkraut and other foods that are preserved with salt such as pickles, jerky, etc. So there was a wider appeal with the nuts that did not have salt and there is a naturally lower sodium count. If the salt content of the water were really high it would affect microbial growth, but the salt content in the NT recipe must be there solely for taste because it is not enough salt to affect anything but flavor. 3. Follow up question: so is salt not necessary in the soaking process to break down the phytic acid content in the nuts?? Is it just the soaking that does this? Well, it is my understanding that the seed, when it falls to the ground, will eventually get wet and stay moist in the fall when the temperatures are cooler and then go through the winter and into the spring before all the metabolic inhibitors that it contains are gone and the temperatures comes up. It is then that the seed will sprout. Salt is not a part of that process, yet the phytates are “rinsed” away by the rain and melting snow. I have done both methods and I do not see any chemical reaction taking place nor do I see a significant difference in the nuts. Even the shelf life of the nuts after they are dried does not seem to be affected by the salt content. The most important factor in the shelf life of the nuts and the possibility of aflatoxins, molds and bacteria is the moisture content of the product that is being stored. Long story short: As a chemist and as a person who has read all I can get on this, as well as done some testing and sampling, I believe it is not necessary to have salt in the water to break down the phytic acid. I believe it is the soaking and possibly the dehydrating that lowers or eliminates the phytic acid and the salt has nothing to do with it. Update: These days we don't eat nut butters much anymore, so we will eat regular organic peanut butter from the store, but if we were eating it a lot, I'd use the healthier options mentioned above or here or here. Did you roast your peanuts after soaking and dehydrating when you made the peanut butter? If you didn’t roast that may be why it didn’t taste right. I was just windering — does the fact of adding a small amount of nonhydrogenated organic palm oil and sea salt to peanut butter make it any less healthy a product than if made from 100% peanuts? Okay. And woud you go as far as to say that adding non hydrogenated palm oil to peanut butter makes it some healthier than if made from just peanuts alone? sea salt is no good, red palm oil is good, but palm kernel isnt. also peanuts generally are not healthy either… best to leave the stuff alone all together, unless your poor on a budget. Kelly – Do some research into Valencia peanut butter. Valencia peanuts are grown in New Mexico, in a VERY dry climate, and as such the growing conditions themselves generally do not allow for the growth of aflatoxin mold. Unfortunately, last year’s Valencia crop was destroyed, so we’re eagerly anticipating this coming year’s crop. I enjoy your newsletters. They are very informational. After I placed an order, I started receiving 2 of each posting. Could you take one off,please? I want the newsletter, but I don’t need 2 of the same one.